Successfully Added Easy MP3 Car Kit with 1GB - Simple Bluetooth Calls + Music to your Shopping Cart. 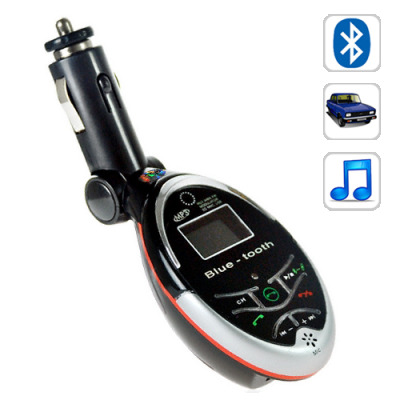 Easy to use MP3 car kit that has easy-to-use bluetooth and entertainment functions. New 2010 version of our popular CVSCJ-7903 now comes with a bonus remote controller for even more convenience! This handy little gadget has managed to combine two of today's most popular add-on technologies for the car and build them into one device. The Bluetooth FM transmitter will pair with your mobile phone to provide you with great handsfree bluetooth functions for your cell phone. You can also listen to your MP3 collection using the FM transmitter, it is as simple as loading up the on board 1GB memory or plugging in a USB/SD card and hearing the beautiful digital sound over your own cars stereo system. When you answer a call your music will be paused automatically and when the call is ended the music will resume playing. This product is easy to install, simply plug it in to your cigar lighter, choose a frequency for the unit, tune your radio and your set. The unit also features rewind, pause and fast forward controls for simple music navigation. In the modern age of Bluetooth tech, a handsfree car kit has become a necessity, by pairing this simple unit to your car stereo you can listen to your tunes, never miss a phone call, and be safe and legal while driving - the ultimate winning combination! As with all our products, this item comes with our famous 12-month warranty and it is in stock in our warehouse right now for immediate shipment. Click "add to cart" to order yours today and we will express ship it out to you tomorrow!